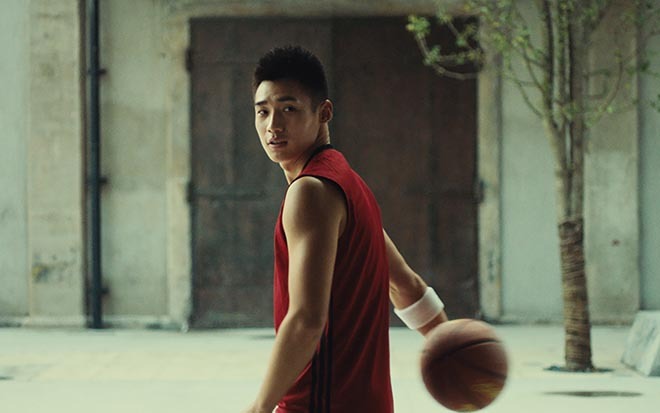 The adidas One in a Billion commercial’s mass basketballer scenes poke fun at the 2015 Under Armour “Rule Yourself” campaign which focused on athletes repeating their actions over and over again to perfect their skills. The adidas One in a Billion campaign was developed at 72andSunny, Los Angeles​ and New York, by chief creative officer Glenn Cole, group creative director Frank Hahn, creative director Wei Wei Dong, creative director Matthew Carey, creative technologist Tim Grover, copywriter Ben Wiley, designer Brandon Mai, chief production officer Tom Dunlap, executive producer Kerli Teo, producer Jenny Jones, group brand director James Stephens, brand director Ryan Warner, brand manager Brian Kim, brand coordinator Brittany Allen, group strategy director Sudeep Gohil, strategy director Ginger Xiang, senior strategist Marc Pardy, strategist Bogart Avila, partnerships and legal director Christina Rust, partnerships and legal manager Kelly Ventrelli, junior partnerships and legal manager Noah Winter, working with adidas VP, Global Brand Communications Ryan Morlan, global brand communications director Jenny Chen, creative production and shoot senior manager Eleanor Fitzgerald, adidas China sports performance brand director Marc Leroux, brand activation VP Philip Ho, brand communications senior director Josephine Tsai, brand communications director Lorna Leo, brand communication training manager Amy Fan. Filming was shot by director Max Malkin via Prettybird with director of production Tracy Hauser, producer Matt Wersinger, executive producers Kerstin Emhoff and Ali Brown. Editor was Bruce Herrman at Lost Planet, New York, with executive producer Krystn Wagenberg and producer Paolo Solarte. Sound was designed at Barking Owl by sound designer Michael Anastasi, executive producer/creative director Kelly Bayett and producer Ashley Benton. Finishing/VFX were produced at The Mill NY executive producer Melanie Wickham, senior producer Eliana Carranza-Pitcher, production coordinator Ashley Goodwin, shoot supervisor Eliza Randall, 2D lead artist Ilia Mokhtareizadeh, 2D artists Vi Nguyen, Andre Vidal, Mikey Smith, and Kyle Zemborain, motion graphics team Laura Nash and Chris Mennuto. Color was produced at The Mill NY by colorist Mikey Rossiter, color assistants Nate Seymour and Elias Nousiopoulos, executive producer Dee Allen, producer Natalie Westerfield and colour coordinator Evan Bauer. Sound was mixed at Heard City by audio mixer Eric Warzecha, producer Andi Lewis, and executive producer Sasha Awn. Music, “Ash/Black Veil” by Apparat (Sascha Ring), was supervised by Daniel Cross.